Horror icons Boris Karloff and Bela Lugosi created some of the most memorable performances in cinematic history. Their unforgettable performances as Dracula and Frankenstein's monster terrified a generation of moviegoers and when these two legendary actors came together for a series of films in the 1930s, audiences could not get enough. 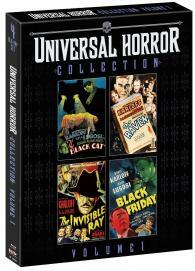 This four-disc collection includes The Black Cat (1934), The Raven, The Invisible Ray (1936), and Black Friday.